WASHINGTON — The Trump administration may push for new work requirements and rent hikes for people in federally subsidized housing, according to a draft proposal from the Department of Housing and Urban Development obtained by NBC News. The proposal under consideration would allow public housing agencies and private owners of Section 8 rentals to impose new work requirements on tenants who receive federal housing subsidies, according to the draft, which was provided to NBC News by two outside housing experts. The changes detailed in the draft could have sweeping consequences for the estimated 5 million low-income households receiving federal rental assistance, reflecting the White House’s broader effort to tighten the federal safety net. Last month, the Trump administration invited states to introduce work requirements to Medicaid and has approved Kentucky and Indiana’s plans to do so. The administration is also aiming to bolster work requirements for food stamps. The draft proposal, which is dated January 17, was first reported by The Intercept. The Department of Housing and Urban Development declined to comment, and the White House’s Office of Management and Budget did not respond to a request for comment. According to the draft legislation, which would require Congress’s approval, public housing authorities and private owners could require up to 32 hours of work per week, on average, for each adult in a household who is not elderly or disabled. Vocational training and education could also count toward the requirement, along with employment, but not volunteer service. The proposal would also open the way for states to make work a condition for rental assistance, says Will Fischer, a policy analyst at the Center on Budget and Policy Priorities, a center-left think tank: "States have legal authority over housing agencies, so once federal law allows work requirements states could choose to direct housing agencies to impose them." 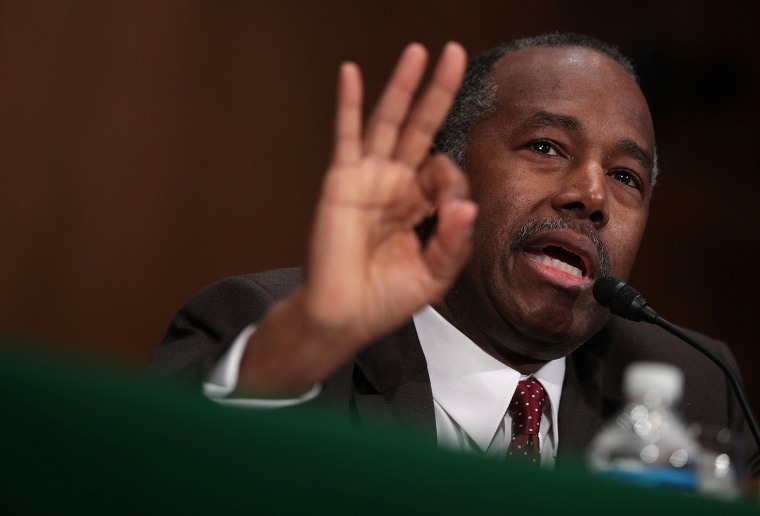 While HUD Secretary Ben Carson has long preached about the importance of self-sufficiency, the draft is the first detailed proposal for work requirements that has surfaced at HUD since the beginning of the Trump administration. House Speaker Paul Ryan, R-Wis., also promoted work requirements for federal rental assistance in his 2016 proposal to combat poverty. The work requirements, as detailed in the draft, would only apply to a small fraction of those receiving federal housing aid. According to the CBPP, 55 percent of those receiving federal rental assistance are elderly or disabled, and 26 percent are already working. Of the remainder who are not working, a significant percentage are caregivers for preschool children or a disabled person. The Trump administration pushed for similar rent increases in last year’s budget, which never passed. The new draft proposal, however, includes a significantly higher mandatory minimum rent based on the federal minimum wage, calculated to be about $150 per month. Last year, Trump’s budget proposed minimum rents of $50 per month. Elderly and disabled families who receive rental assistance would have to contribute 30 percent of their monthly income, with a minimum rent of at least $50 per month. Currently, the minimum rent for most households receiving rental assistance ranges from $25 to $50 per month, and some of the poorest families pay no rent. Yentel says the rent increases that the Trump administration have previously proposed, and that are outlined in the draft, would have the greatest impact on seniors, the disabled and families with young children, who would no longer be able to deduct medical costs and child care from the income used to calculate their rent payments. “That means less money they have of their very limited income to pay for medication, healthy food, clothes for kids to go to school,” she said. Democrats also pushed back on the idea. "Only this administration would respond to rising homelessness by trying to increase the eviction rate," Sen. Sherrod Brown of Ohio,said in a statement. "Just weeks after giving massive tax breaks to billionaires and special interests, you would think this administration would be embarrassed to propose raising fees on the small share of low-income Americans who get federal help to keep a roof over their heads." Housing experts and advocates anticipate that the Trump administration will try to move forward with these proposals when it releases its budget, which is expected in the next few weeks. The administration could also push for work requirements without passing new legislation through a demonstration program that Congress voted to expand in late 2015, but which has yet to be implemented fully. Under the demonstration program, a small handful of public housing authorities have already experimented with work requirements, as well as rent increases. In Charlotte, North Carolina, researchers found that work requirements increased employment without increasing tenant evictions, though they cautioned against imposing the requirements more broadly without further study. Diane Levy, a researcher at the Urban Institute, an economic and social policy think tank in Washington, agreed, pointing out that very little is known about some of the most basic questions involved, such as whether work requirements do ultimately help move tenants off assistance. "Are they able to keep jobs, and is it making a difference in their ability to have a stable income?" she said. "We don't know."